Programs and web sites that remember our passwords are pretty handy. The Window opens showing the asterisks (****) covering the password, we click Ok and we're in. But what happens if we forget that password and need it again for something. We either didn't write it down or forgot where it was written. That's where Password Reveal comes in. Grab the target icon with the mouse button, drop it on the password box and it uncovers the password. Password Reveal works on most programs and Web Pages. 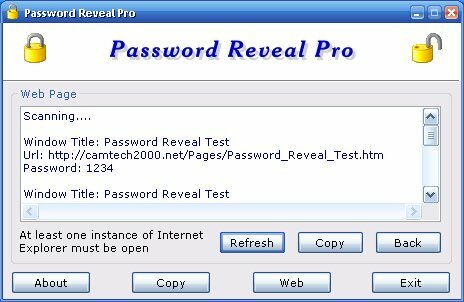 Password Reveal Pro works on most programs and web pages and requires Internet Explorer 5 or above. Will not work with Netscape or other browsers.